Last week I was invited to an event in London for the launch of 28 by Sam Wood in the UK. 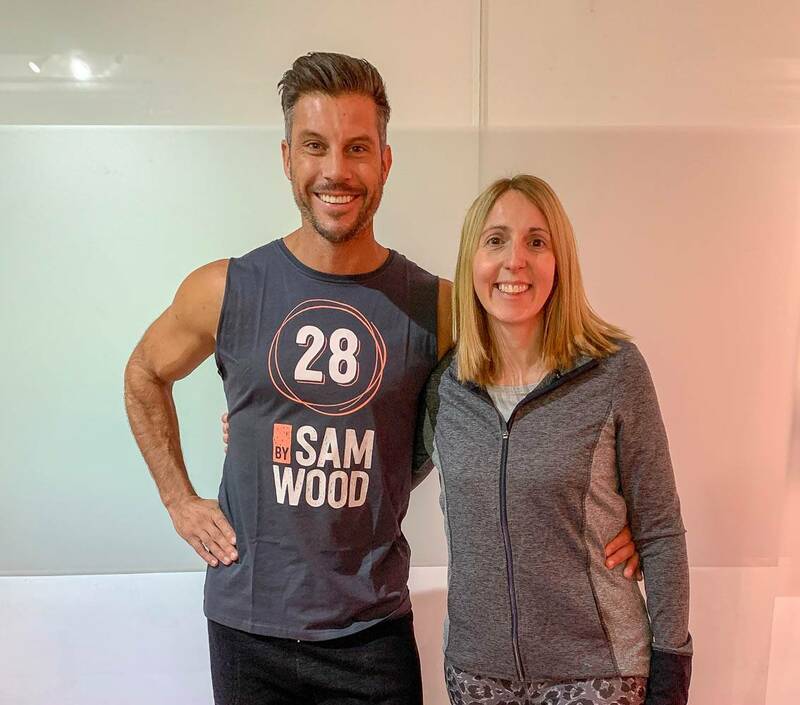 Having decided that 2019 was the year that I needed to get back into doing some exercise, I was really keen to go along and see what 28 by Sam Wood was all about, and whether it was something that could fit into my lifestyle. Whilst 28 by Sam Wood might be new in the UK, it is incredibly successful in Australia already, where Sam Wood is from. If you haven’t heard of Sam Wood before, he appeared on the Australian The Bachelor programme, which is a very popular programme in Australia. Before Sam appeared on The Bachelor, he was a fitness instructor and owned a very success gym franchise across Australia. Following the success of The Bachelor, people were asking how they could follow Sam’s fitness programme when they don’t have one of his gym’s near him. This is how 28 by Sam Wood was born. There was a real desire for people to be able to access Sam’s fitness programmes from anywhere. Sam sold his franchise business, and how has 1 gym in Melbourne and went about setting up 28 by Sam Wood. When Sam was creating 28, he didn’t think his target market would end up including Mum’s at home. But that’s exactly who it appeals to and as a Mum myself I can totally see why. Before I had children, I was a member of a gym and I felt comfortable there. But now 6 years later, there is no way that I could go to a gym. I feel intimated, that everyone is watching me and I have no clue how to use all the machines. I know that I am not alone in feeling like this. But, I do want to exercise, and I needed to find something or someone to motivate me. That is where 28 by Sam Wood, could be the answer. When I was at the event I had a chance to talk to Sam and also, take part in an exercise class. In case you’re wondering why its called 28, its because that is how long each workout is for, 28 minutes. That is all you need to do each day. Sam took us through a 28 minute workout. What is good is that you can work at your level, and when you set yourself up on the programme, you select what level of fitness you’re at. The workout was good, it pushed me, but I was also in control knowing what my body could handle. And yes I definitely felt like I had worked out by the end. But I felt so good for doing it. On the Bachelor Sam fell in love and went on to marry Snezana and they have a baby together. He said that when their baby daughter Willow came along, fitness was the furthest thing away in Snezana’s mind. But over time she realised that doing a little bit of exercise, even just 10 minutes in the morning was giving her more energy to actually get through those tough sleep deprived days. This is what I need to remind myself of, that exercise releases endorphins that give you more energy and a spring in your step. After our workout, we sat down to have brunch and a chance to talk to Sam. What I like about the 28 by Sam Wood program, is that it not only covers exercise, but nutrition too and it guides you on what to eat, with lots of great recipes. 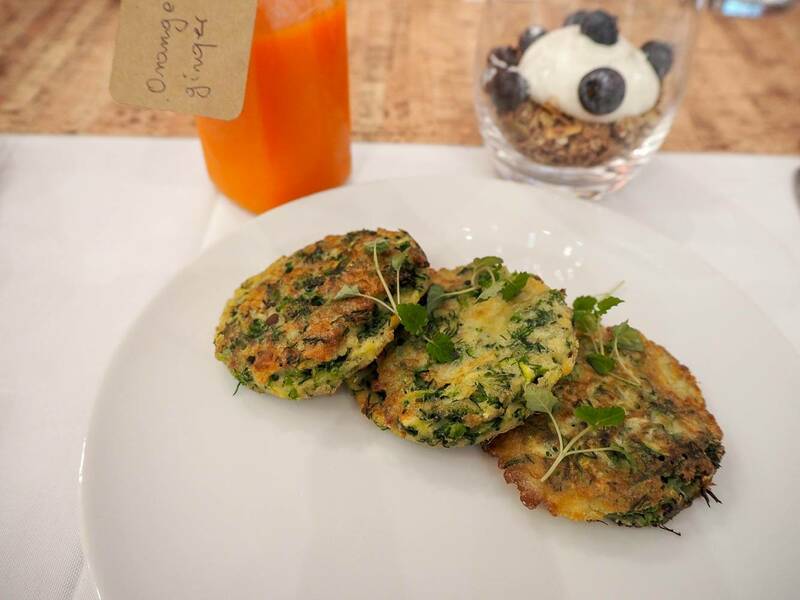 I got to try the Green Cheese Fritters which are part of the nutrition plan that you get with your membership and they were delicious. 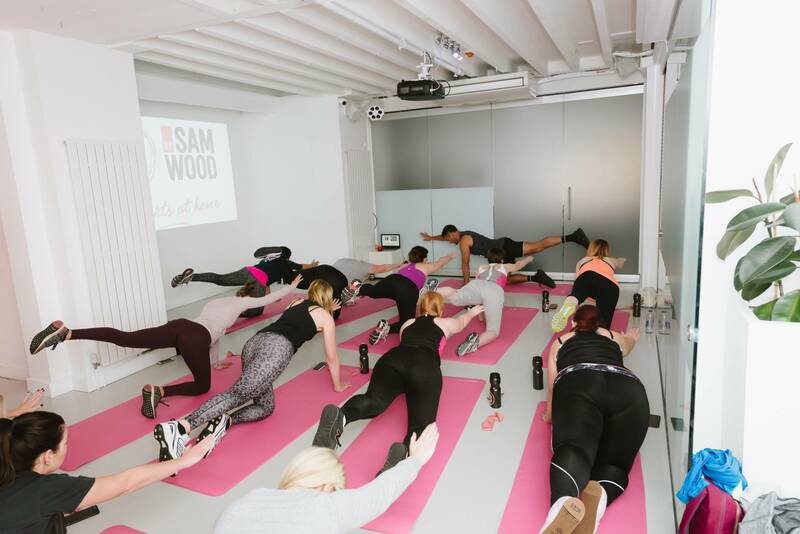 I came away from the event motivated and hopeful that I had a fitness program that I could do in the comfort of my own home, it was only 28 minutes out of my day and Sam would be popping into my inbox everyday to motivate me! It’s a home workout, nutrition plan and well-being program all in one. It’s only 28 minutes a day and is a different workout everyday. You can set your level of fitness, to have a workout that suits you. You get sent a motivational video message from Sam to help you stay focused and not feel like you’re doing this on your own. It costs £28 a month, which is less than £1 a day and you can unsubscribe at anytime. You’re not tied into a contract. 28 by Sam Wood launched in Australia in 2016 and over 120,000 people have joined the program. The Program shows you that real transformation is possible with just 28 minutes of exercise a day and healthy eating. I’ve been trying it out at home and working it into my lifestyle. At the moment my body isn’t ready for me to do exercise every day, I need to build up to it. But I love that I have a program that I can do at home, around the children and when I do it, it makes me feel better about myself. You can find more about 28 by Sam Wood, over on the website. Disclosure: I’m working on a paid partnership with 28 by Sam Wood, but all words, opinions and content are entirely my own. Ooh I have never heard of this before but I am looking for something I can do in the comfort of my own home and this sounds perfect!! That breakfast looks yummy! I think we could probably incorporate 28 minutes a day of exercise! This sounds very achievable and a great way to get fit! That sounds really good. I’ve been very lax lately where exercise is concerned. I’m waiting for warmer weather to return so I can hit the pool (it’s outdoors). Until then something like this would be ideal! Interesting information here. I am looking to improve my fitness life. Love the sound of this. I also work out at home and find these sort of programmes so much easier to stick to than going to the gym. Great to be able to work out from home. I am now trained as a yoga instructor and I love it so much. Oh wow I so need to sign up to this, I struggle with time more than anything. I need to exercise when the kids are all in bed so this would be perfect for me! !